You may well have heard of apple cider vinegar before. This highly nutritious and complex health tonic has been used to treat a huge range of ailments since the times of ancient Egypt. However, it is not just we humans that benefit from ACV and its many healing properties. 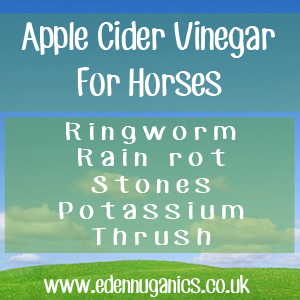 Horses also greatly benefit from apple cider vinegar, largely due to the high levels of pectin and acetic acid that occur naturally in the vinegar. In what ways can Apple Cider Vinegar help my Horse(s)? Horse Hoof Care - Thrush and other forms of foot fungus are extremely common in Horses, especially in the area known as 'the frog,' a triangle shaped patch that covers around 25% of the underside of the hoof. To treat this infection, simply add 2-3 cups of apple cider vinegar to a gallon of water, then apply to your horse's foot using a soft sponge. Horses Need Potassium - It was noted in the popular book 'folk medicine' published in 1958 that horses would chew on wooden stalls due their potassium content. As soon as apple cider vinegar was added to the water supply this behaviour stopped. This is due to the high levels of easily absorbed minerals found in raw apple cider vinegar. Intestinal Stones - The removal of intestinal stones can often involve a costly operation. Including apple cider vinegar in your horse's diet can avoid the worry and costs involved with this process. ACV helps to increase the levels of acid throughout the intestines, making it much harder for stones to form. Rain Rot - Rain rot - a type of bacterial infection known as Dermatophilosis - is naturally present within the skin. Infection occurs when the skin is compromised often due to prolonged periods of wetness. Apple cider vinegar can be used in its raw, undiluted form as a treatment for this condition. Won't Drink Water? - "You can lead a horse to water, but you can't make it drink." Or can you? If your Horse doesn't like drinking water from new locations, a handy trick is to add a few dashes of apple cider vinegar that will offer an instantly recognizable taste. Ringworm - The name of this ailment is somewhat misleading. Ringworm is not caused by worms, but in fact is the name given to a fungal based skin and hair infection. Often treated with a copper wash, apple cider vinegar is a safer alternative that does not pose a risk to your horses eyes. 1 spray bottle, an indoor plant sprayer works well for this job. The first step is to add two cupfuls of raw apple cider vinegar to the empty spray container. Next, add one cup of water. This dilutes the mixture slightly. The next step is to add two tablespoons of eucalyptus or citronella oil to the mixture. Make sure to mix the oil in well as it likes to separate from the ACV. Next, it is time to apply the solution to your Horse. When spraying, it's best to hold the bottle around 30cm away from the your horse's back. Pull your horse's hair apart in affected areas, helping the apple cider vinegar to reach the skin. This natural repellent spray not only deters flies but applies its powerful antibacterial and anti-fungal properties to any skin abrasions your horse may be suffering from. Never use commercial fly repellents containing DEET on your horses as it can be absorbed through the skin with toxic side effects. Apple cider vinegar helps to promote healthy joints. Balance your horses pH levels using ACV. ACV helps your horse digest food better. Apple cider vinegar helps to boost your horse's immune system. Great natural bug and insect repellent. As you can see there are a huge variety of health benefits available to your Horse by including this one simple ingredient to their weekly care routine. It's also worth mentioning that for maximum health benefits, raw, unfiltered apple cider vinegar is always the best type to use.